Braeden: "There's no appreciation that I've been an important part of the show"
(Entertainment Weekly) -- In yet another blow to the already ailing soap opera world, Eric Braeden, the venerable star of CBS' "The Young and the Restless," has exited the top-rated daytime drama after a nasty negotiation with Sony. 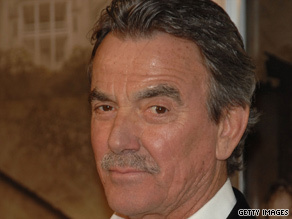 Eric Braeden's last episode as Victor Newman will air on November 2. The production company wanted the popular actor to take a pay cut for playing mega mogul Victor Newman, but Braeden -- who's been on the soap since 1980 -- opted to leave instead. Barring any last-minute change, Braeden's final episode will air on November 2. Reps for Sony and CBS had no comment, though one insider indicated that no further talks are planned. EW talked with Braeden, 68, about Sony's decision to exercise a draconian clause in his contract (his deal that was set to expire in November 2010 can still be renegotiated every 26 weeks) and what it means to the future of daytime dramas. EW: Where do things stand? Did your representative counter Sony's offer and you have yet to hear an answer? EW: As of today, are you willing to take what Sony offered? Braeden: No. There is no appreciation of the fact that I've been an important part of the show for 27 years that has been No. 1 in the ratings. That's extraordinary. So to be dealt with in a perfunctory matter as if you had just known these people for a few months is what is most offensive. This is a certain corporate culture now that is very deleterious. EW: Is it true you offered to take a pay cut before? Braeden: I was the first one [to offer] because I knew that if we all did it, we would insure the continuation of the show. I did it two years ago when I signed my last contract, which I thought would last until next November. EW: Did you say your on-set goodbyes? Braeden: I said this could be a long goodbye, and I may not see you for a long time. Who knows? I'm not saying I've been let go -- we're still negotiating. But it feels like that. EW: What does this say about the state of the industry when a production company is asking the star of the No. 1 show in daytime to take a pay cut? Should everyone be worried? Braeden: Yes, though it depends on what the star does. All options are open right now. What can I tell you? I know there are certain economic realities that dictate the actions they are taking right now, but the manner in which its being done is most insulting. EW: You taped your last episode on September 23. Was that the way you wanted Victor to go? Braeden: No. It was rushed. It was obviously meant to intimidate. It was obviously done with enormous forethought to coincide with the end of the 26-week cycle. Essentially that is what the business is doing now and has been doing for a while. And quite frankly, it's outrageous. When I sign a three-year deal, I'm obligated to fulfill that deal. The producers, however, can come to me after a half-year and say, "We've changed our minds." Where in the world of business does this kind of contract exist? Do I blame the people for wanting to squeeze as much out of us as they can? I do not. The question is, when do you squeeze too much? EW: Would you do another daytime drama? Braeden: I doubt that. Never say never in this business or in life, but I doubt that. EW: Can you see the genre still existing in 10 years? Braeden: Yes I can. How many reality shows can you watch? They're so obviously phony. Our show deals with adult problems in a long continuous manner, and very much like the way things are dealt with in real life. In that sense I think there will always be a need for (soaps). They're almost novelistic in their approach. Copyright 2009 Entertainment Weekly and Time Inc. All rights reserved.